to have been part of the extraordinary adventure that was stimulated by, and masterminded by, Robert Priseman. I have Terry Greene to thank for suggesting I contact Robert over a year or so ago and beginning my own small part of what has been quite an amazing story. It was the exchange of paintings, mine from the Very Like Jazz series and the gift of a lovely panel picture from Robert in return, that led to the invitation to be included in Contemporary Masters From Britain currently on show at Tianjin Academy of Fine Art having visited three other large Chinese venues since the summer. Tianjin is, apparently, the sixth largest city on the planet! and I’m ashamed to say that until recently I’d not even heard of it. Things in the world are changing fast it seems. Being a part of this tour that ends in January is only a small part of being in the Priseman-Seabrook collection as it features on the Art UK website and is an on-going venture that unites a great many of our best painters. It’s been good to meet and get to know artists such as Lucy Cox, Freya Purdue and several others…and hopefully more in the future. Its helped me over recent weeks as I’ve been feeling unwell and am still struggling with a (so far) mystery ailment that is severely restricting my productivity. Not least in keeping up this blog as well as getting on with my painting. I had hoped to end the year with at least two current bodies of work pretty much rounded off, but sadly they both have a way to go yet. So it goes. Nonetheless the New Year already promises fresh opportunities. Firstly my good friends Jackie Berridge invited me to be a part of an exchange with artists in the Honfleur area of Northern France in April. As a long time fan of Boudin, a local boy made good, it was too good to miss. And another friend the excellent painter (and printmaker) Laine Tomkinson is putting on a show in Nottingham Make Colour Sing in May so much to look forward too. People; What Are They Like? I’ve been rather busy putting this together – an exhibition of the work of six artists focussed on the observation of folks as they go about their day to day lives. It opens on Thursday (2nd November, 2017) at Déda, the dance dedicated arts centre in Derby from 18:30 – if you can come along we would love to see you. Its been a voyage of discovery for me personally, not least as figuration is very much not my usual turf, and four of the six artists I’ve chosen were not known to me before I started to put it together. Of the two I did know its been a real pleasure to be able to share some of their work with new audiences as it is my view that they deserve to be admired widely. Ellie Young from Cardiff is one of those I found out about as I searched for painters whose work is firmly focussed on observation. In her case it can be very direct (she has undertaken a project making 15 minute portraits at a local centre) but also from photos and film, indeed film is a great love of hers and though there are elements of caricature in her work it is fleeting impressions and glimpsed moments that seem to especially inform her work. Sue Stone (based in Grimsby, Lincs.) is another whose work makes extensive use of photographic sources though these are often wrestled into fresh configurations in her beautifully constructed pieces that combine exceptional qualities as a ‘textile artist’ with painted elements. Her interests are in the wider realm of how memory plays such a vital part in our reading of images of people. An element of nostalgia might be read into the paintings of Helen Latham from Cambridge and they certainly have a very particular mood but often the subjects are very much of our time, and there are, to my eye at least, disturbing undercurrents in several of the images. 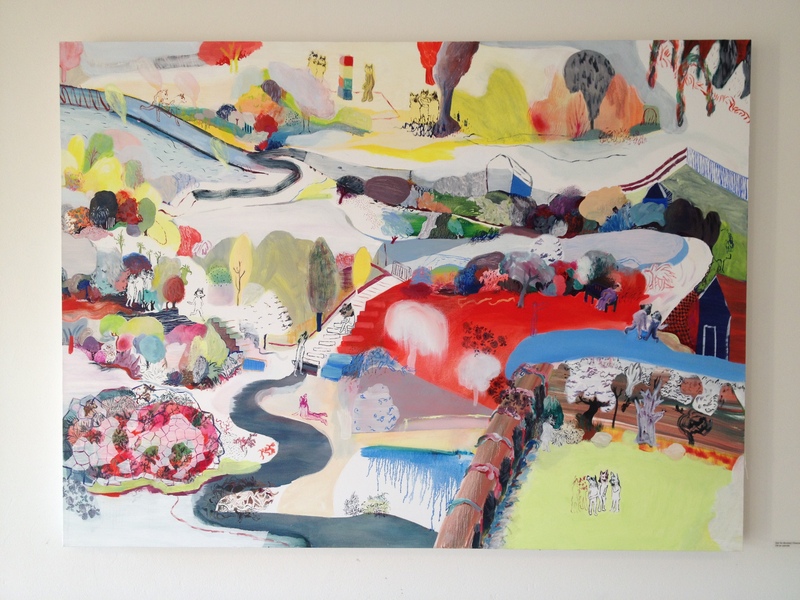 Taking us, quite literally, to another place is the work of the painter, Anna Pinkster, whose acute observations of people going about their daily lives in Vietnam are imbued with a freshness that belies their carefully considered realisation in her studio in rural Somerset. And their marvellous vitality leads back into those artists who work I did know. Firstly Jackie Berridge from Southwell, Notts. is an artist I’ve known for many years but over the past decade she has become both the exceptional draughtswoman she always was but also a painter of rare distinction. In her work a highly original cosmology exists in which episodes from childhood are interspersed with mature reflections on the human condition in paintings or, as here, drawings that are, on another level, simply lovely to look at. So back where we began the drawings of Paul Warren take us into yet another personal universe. And this is where my quest started because my whole impetus for the show came from wanting to see more of Paul’s work in the public realm. His particular – and peculiar – vision is something he shares with the artist Ian Breakwell & the artist/musician Kevin Coyne, both school friends back in the 1950’s at the Joseph Wright School of Art in Derby. In their world view they forensically examine the human condition, all its foibles and frailties, but with a certain affection and – most crucially – a wicked and delicious sense of humour. And if this show does nothing else it will expose and celebrate Paul’s contribution to this remarkable triumvirate of artists that came out of this city in the 1950’s. Its been too long since I made a posting and sadly I’m too busy right now to do the kind of detailed discussion of several of the things I’d wish. So it’s a brief round up instead. Of course the way the western world is turning right now is a wee bit distracting too. I try to refrain from comment on these matters here but sometimes it seems that the craziness out there is getting worse at the moment. My good friend Simon has put the UK insanity over the ‘European’ question down well so go read him if needs be. And looking across the pond it looks equally bizarre…so we watched again the other evening the classic ‘The Thick of It’ that puts it all into some kind of perspective I guess. Another friend of mine has, with much admiration from here, put his boots on the ground in the cause of the refugee crisis that the antics of the UK government succeeding in knocking off the European leaders agenda when surely they ought to have been focussed on that (see his blog for details). But enough of that from hereabouts…it’s hard not to feel powerless in all this. But carrying on painting does occasionally feel very indulgent and a bit futile in the face of all the mayhem. Still its what I do I keep telling myself. And taking an idea from the excellent Andrew Bracey I keep tweeting a detail a day of whats cooking so in this blog there’s a couple of them. Besides working there’s been some trips out…one to the Harley Gallery in Welbeck, North Notts. Here artists Craig Fisher, Louisa Chambers and Rob Flint have been jazzing up the space using the notion of the ‘dazzle camouflage’ – that got quite an airing a couple years back at the centenary of it’s ‘invention’ with Carlos Cruz-Dias redoing one in Liverpool, Tobias Rehberger doing it in London and with the most media coverage Peter Blake knocking one out on the Mersey Ferry. I’m pretty sure the idea behind this show was more the eliding of their three various and varied approaches to abstraction and the use of pattern and geometry and ‘seeing’ where it might take them and the space they occupied over the show period (sadly it ends tomorrow). When I saw it a goodly portion of the show were the various readymade works installed and the additions were still very much on progress. But you still got an idea of way in which the collision of particular pieces, pattern and colour throws up new and surprising visual tropes and how this broad field of abstraction still holds a fascination for a much younger generation of painters than those of us who grew up with the geometry of Vasarely or Riley or Stella and Noland and so on. If we do now live in the post-factual world (as I heard a commentator on the rise of Trump say a few days ago – Prof.Larry Sabato,Newsnight BBC, 24 Feb) then ideas of what ‘works’ in abstraction are as irrelevant to a consideration of a show of this kind as facts are to the likely GOP candidate this coming Fall. One of the most interesting aspects of the show here was the way in which each artist privileges process and material. Chambers use of folded paper models as subject matter in what might otherwise be quite traditional modern paintings, Flint’s use of washing up cloths as ground and figure and Fisher’s OHP projections. All in all it was intriguing and visually compelling and even in this relatively early stage, commanded and shaped the space oddly – not least with the willingness to use lively – even sickly – colour combinations. I’d say, and its meant as a compliment here – all a bit nutty…but here in a good way! Away from the bright lights (and the money sadly) my work – in a modest way – is out on the gallery wall at present at Repton’s New Court, where I showed the Winter Cycle a few months back. The show is titled ‘View Of Delft: The World In Art‘ and is curated by Charmaine Tam, currently at Repton School but shortly off to Cambridge to read Art History. She interestingly mixed student work with five artists, myself, Jackie Berridge, Lisa McKendrick, Melanie Russell and Ruth Solomons. Wisely and modestly she didn’t show herself but her curatorial eye was good and the range of work covered a lot of ground with the diversity of material offset by sound judgments about what would line up intelligently against one another. Overall I am very pleased to be part of this project that shows off the department’s sixth form work well and suggests that Charmaine may be somebody to watch in the future. Besides Jackie’s work that I know well and have great affection for (full disclosure: we have been friends and sometime studio sharers for many years) I was much taken with Ruth’s small informal drawings on envelopes and Melanie’s small panels (see one below: Box Head & Shoulders Portrait II) accompanied by Hannah Walker’s Map II. 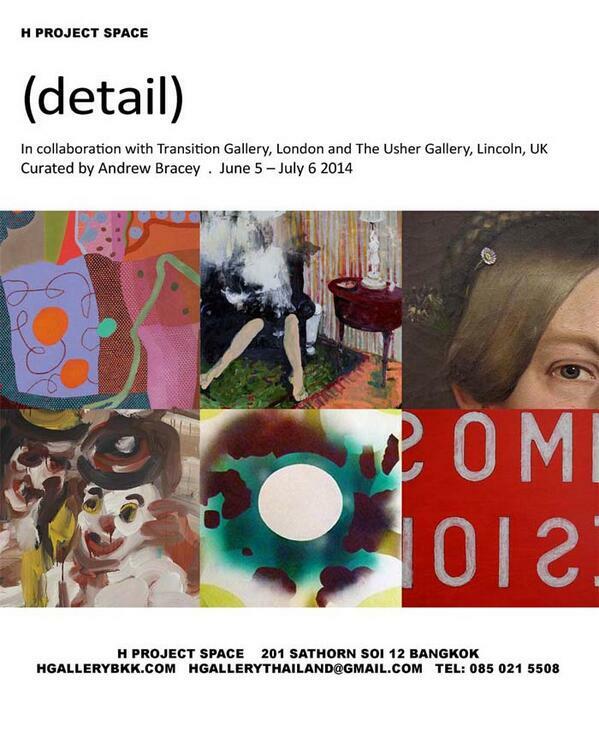 I mentioned here a few months back that I’d been invited alongside many others to be a part of this show (detail) that opens soon in Bangkok, an intriguing idea that may well be more revealing of current painting practice than most. The exhaustingly energetic Andrew Bracey is the curatorial brains behind it and deserves considerable plaudits for pulling something of this complexity together. If you’ve seen any of his other projects you’ll be familiar with his indefatigable commitment to seeing through work schemes that would make most of us blanche but that often result in quite startlingly original and delightful outcomes. 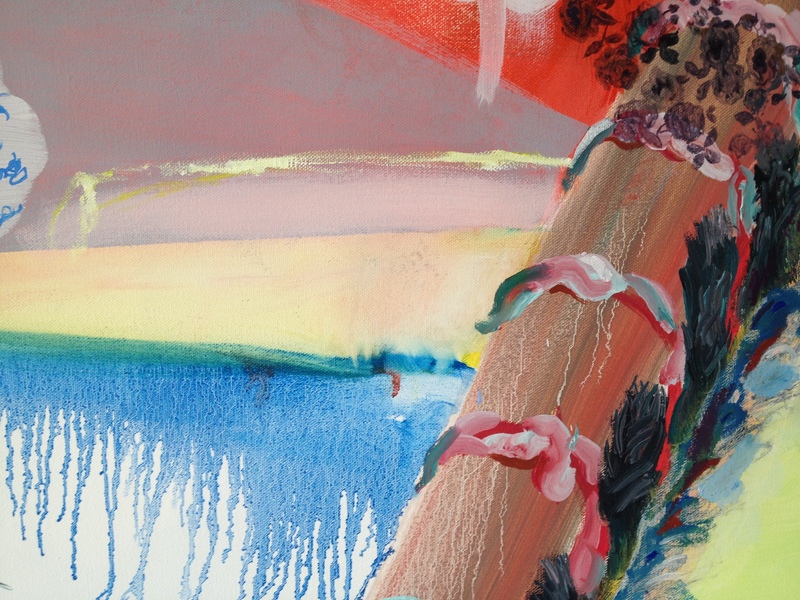 (detail) was in my mind last evening when looking at Jackie Berridge‘s exhibition at the Lakeside in Nottingham. 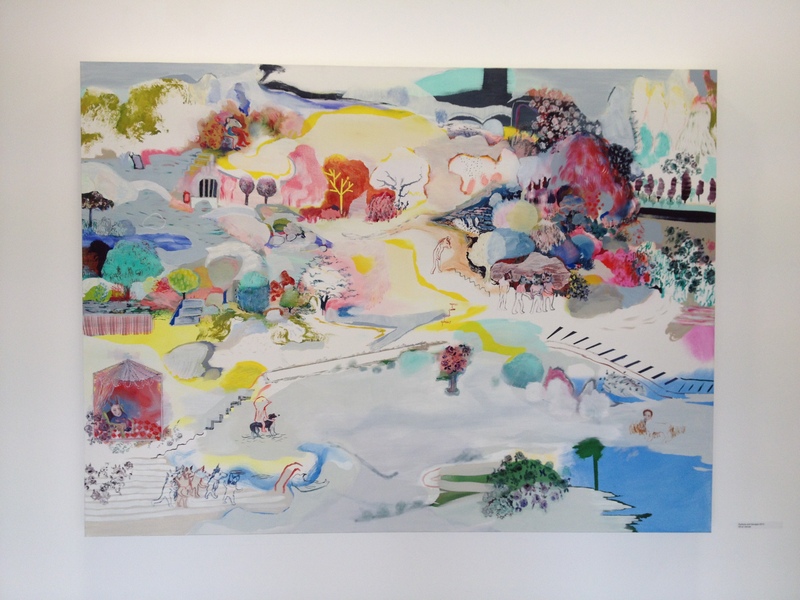 Indeed its hard not to be drawn into the myriad details in these large new canvases that take her (now) familiar (to those of us who know her previous work) creatures into a host of new adventures in a fabricated landscape quite unlike any other I can think of in current figuration. There’s a lot of painting about that deploys the full gamut of painting tropes and techniques (indeed there’s quite a bit of it in Nottingham at present) and some of it is very good indeed. What there is less of is open ended narratives around figuration that are wedded to the same sets of conventions and it is here that these paintings really make their presence felt. I struggled as did my good friend David to think of any recent or current work that was mining the same seam and (without being too immodest) we have seen a lot of stuff between us. 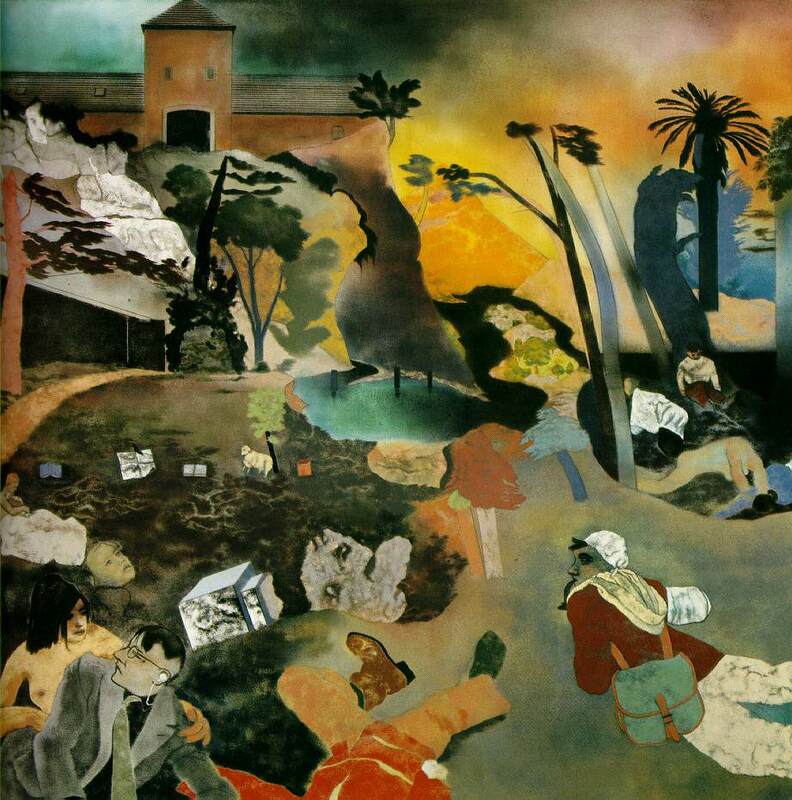 I eventually came up with some thoughts around the 70’s and 80’s School of London where Hockney was constructing brightly coloured canvases of the Californian landscape or RB Kitaj was compacting space in a brilliant picture such as If Not, Not. But neither of these are precedents for these new paintings with their incidents and adventures of a cast of curious characters in a landscape where the teletubbies are as likely to come over a hillock as anyone we might recognise from our own worldscape. I’m always drawn back to the playground of my early childhood with these pictures (I like others have been more familiar with these images as large scale drawings up until now) but with the painterly elements of colour and handling we seem to have moved into another even more dreamlike (and sometimes nightmarish) vision. The colour palette is especially rich and in a warm early evening spring sunlight it was set off to particularly good effect but it only serves to lure the viewer into an initial security that is entirely disturbed by the content, both formal and narrative. What is really strong in this work too is the knack of knowing when to leave well alone so that painterly incident and the author’s handwriting shines through. This is good stuff and shows Jackie’s work reaching a maturity not just as the excellent draughts person she has always been but as a painter of real authority. I’d say you should go see it. And as mentioned above there is plenty of marvellous detail here that would have sat nicely in (detail)…and if you can’t make it to Bangkok (!) then fear not as it returns to the UK later in the year and Andrew is also putting a website up shortly that I’ll signpost here when available. Is God in the details?..well we’ll get another chance to make up our minds then.